The mighty Yamaha SR400 is making its last stand. While you can still buy a brand new SR in some countries for now, stricter emissions laws have signaled the end for the air-cooled single. Don’t fret though—they’re notoriously reliable little thumpers, so we’re bound to see them on the road for years to come. Especially with killer SR-based cafe racers like this keeping the dream alive. This one’s a collaboration between Portuguese builders Nuno Capêlo and Ricardo Santos. 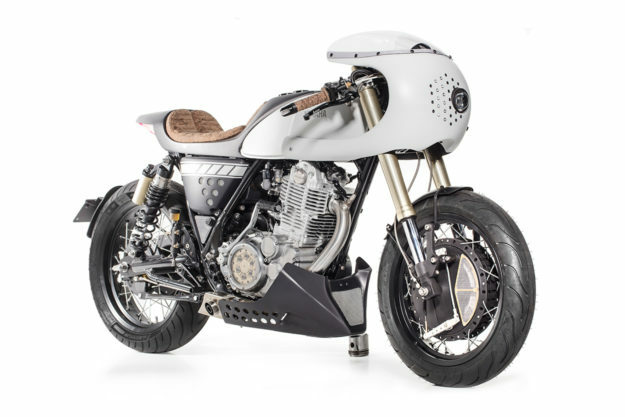 Nuno’s an architect-turned-motorcycle designer; he worked for the likes of it roCkS!bikes and Ton-Up Garage before launching Capêlo’s Garage last year. Ricardo used to be a chef, but after a few years working with Ton Up Garage, he decided to focus solely on his own projects at Elemental Rides. The stars aligned last year, when the two traveled to The Bike Shed London show to exhibit their latest work. 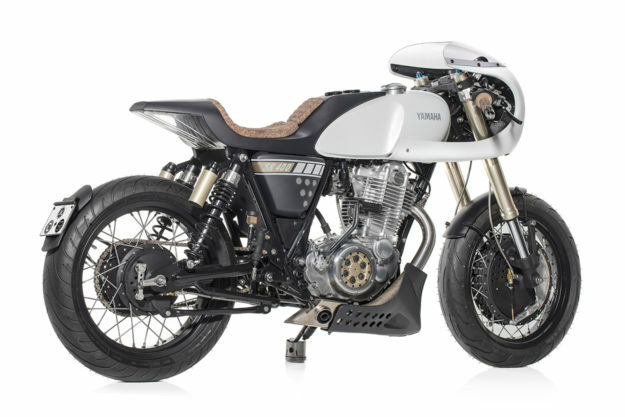 Round about the same time, Yamaha Portugal announced a contest inviting builders to submit designs, with winners getting the chance to customize a brand new SR400. Being good friends, the two decided to pool their resources and design a neo-retro cafe racer that would combine their strengths; Ricardo’s engineering prowess, and Nuno’s architectural flair. But by the time they’d submitted their entry, the contest had been cancelled. 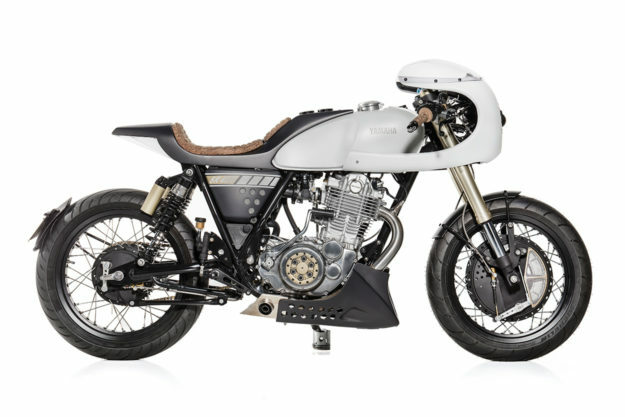 Yamaha Portugal loved their design so much though, that they decided to back them; so the guys had a brand new Yamaha SR400 on the bench in no time. With limited resources and a tiny budget, Nuno and Ricardo set to work in the latter’s garage. 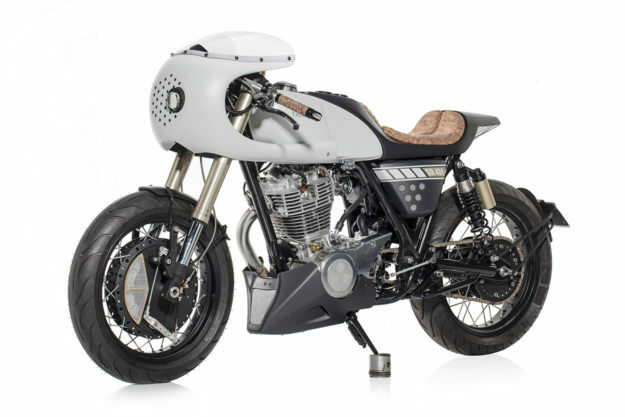 Right off the bat, the duo knew they wanted to make the SR400 as quick and nimble as the platform would allow—without tampering with the modest 399cc motor. So they started by looking at where they could improve the rolling chassis. On went a set of USD forks from a Yamaha YZF-R1, complete with new K-Tech internals. Out back, they added a pair of Showa piggyback shocks, and braced the subframe. The wheels are down to 17-inchers at both ends, shod in wider, cornering-friendly rubber from Michelin. Moving to the brakes, the guys ditched the single front disc in favor of a 260mm four-leading shoe setup, borrowed from a Yamaha TR3 racer. The brakes and the clutch were then converted to hydraulic systems, for more bite and easier maintenance. For the bodywork, Ricardo and Nuno have created a fiberglass rear section, starting with a hand-shaped foam mold. 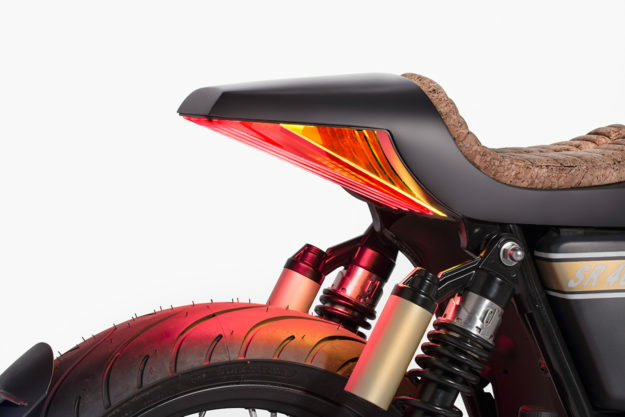 The new unit runs almost seamlessly off the modified stock fuel tank, and ends in a unique, custom-made rear light consisting of several acrylic fins, which handle both taillight and turn signal duties. Where the seat meets the tank, they’ve incorporated a tacho and clock, along with the requisite dummy lights. (There’s a GPS-based speedo further ahead too.) The seat’s a split design, upholstered in a cork fabric. 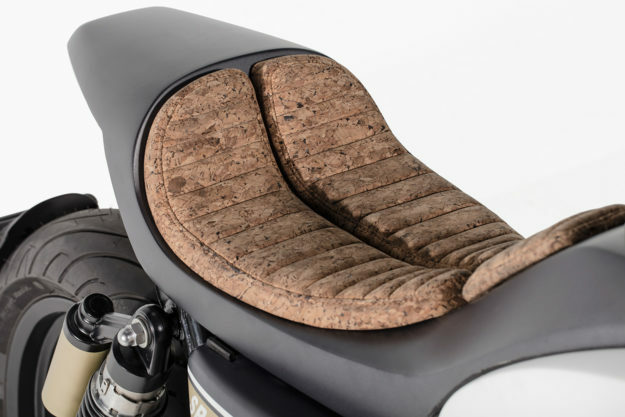 “Portugal is the world’s biggest producer of natural cork,” says the pair, “so we’ve wanted to use that material for some time.” Matching grips and a Monza-style gas cap finish things off. 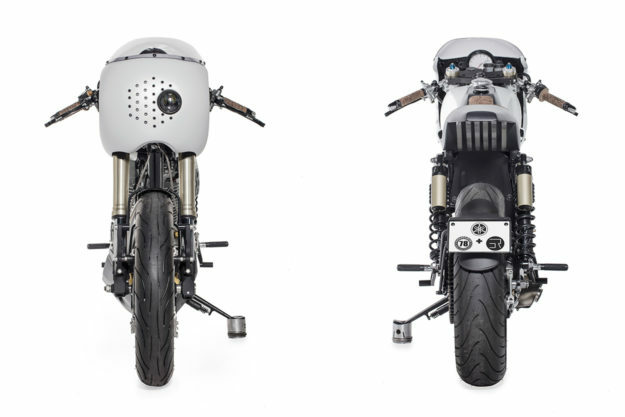 Ricardo and Nuno also designed and built a belly pan, matched to a boxy stainless steel exhaust. “It brings the SR400 close to the ground and gives it a very muscular look,” they say. 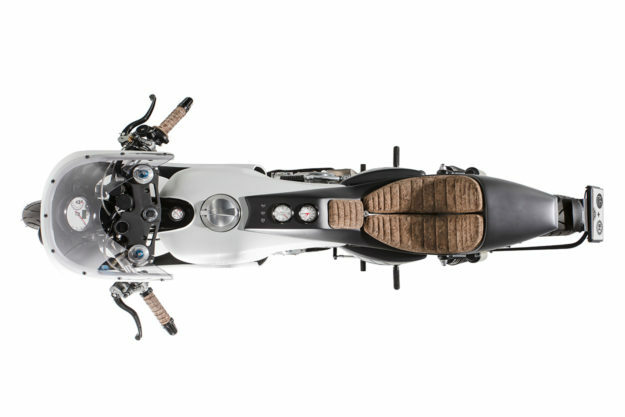 The rest of the bike’s loaded with tiny details like modded side covers, a custom front fender, clip-ons, rear sets, and custom markings on the engine casing. The front fairing is a slightly revised version of the one used on Nuno’s previous Ducati Pantah build, which he also sells. The lighting arrangement uses all LEDs, and includes a running light and high and low beams. But it’s the stark use of black and white that seals the deal for us. 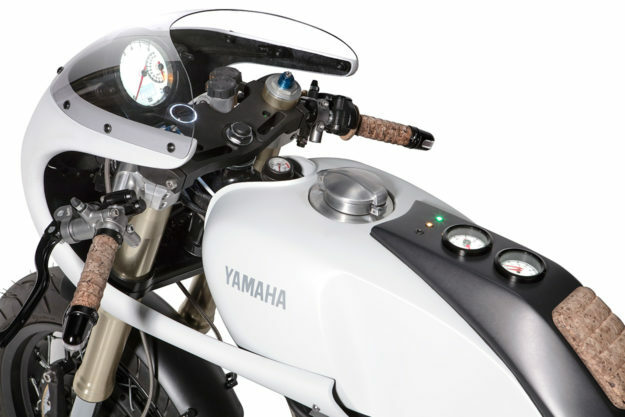 Notice how the curved parts like the fairing and tank are white, and the sharp, modern bits are black. It’s a bit disruptive, but we reckon it fits the ethos of modern meets classic that Nuno and Ricardo were striving for perfectly. Chalk it up as another win for the tough little SR400.